The following information was taken from the regimental records of the Lancashire fusiliers and provided by Michael Doherty the grandson of Dominic Doherty. The landing at Gallipolli on 25th April 1915, was a classic example of one kind of warfare. The Battle of Cambrai, which opened on 20th November, 1917, was the prototype of another. Unlike as these two operations were in most respects, they had in common one feature which may perhaps be called the naval form of support - applied in the one case by the Royal Navy through its command of the sea approaches to the objective and through the guns of its moving ships, and in the other by a new branch of the Army using, for the first time on a large scale (and as a final test of the value of the tanks), naval tactics to secure command of the land and to give covering fire to the attackers from its moving tanks. The 1st battalion took part in both these historic events. After its attack near Langemarck on 9th October, the battalion went to a camp not far from Proven and was employed on road-making till the 16th, when it moved by train to Blaireville, near Arras. Here it spent a month in refitting and in careful and thorough training. Though no hint was given of the scene of the fighting which was being practised, it so happened that the country near Blaireville was so like that near Cambrai that very realistic rehearsals could be held. Towards the end of the month the unit began one of the most strenuous and physically trying experiences which fell to its lot throughout the war. It went by train from Boisleux-au-Mont at 10.28 p.m. on 17th November and arrived at Péronne at 5 a.m. on the following morning. It marched thence to a camp at Haut-Allaines and at 5 p.m. the same day on to Equancourt. These days were foggy, which made approach marches by day possible and materially helped to preserve the secrecy necessary for success. The day of the 19th November was devoted to resting in preparation for the final march to the battlefield. The essence of the plan for 20th November was surprise, which was to be attained by dispensing with the lengthy preliminary bombardment usually arranged and by sending some 380 tanks, the largest number yet used, immediately in front of the infantry to perform the functions of wire-cutting and the suppression of hostile machine guns which had hitherto been carried out by artillery. It was intended by this means to make a breach in the Hindenburg Line through which cavalry could be passed in order to cut off most of the German troops before Cambrai. The 29th Division was to be in reserve during the first phase, in which other divisions on the III Corps front were to capture the Hindenburg Line and its support line which lay about a mile north-east of it. The 29th were then to pass through, capture Masnières, Marcoing and the Bois des Neuf (about three-quarters of a mile north-west of Marcoing), cross the St. Quentin Canal and occupy part of a system of trenches north of those villages which was known as the Beaurevoir Line. It would then be the turn of the cavalry. The 20th Division was attacking with all its three brigades in line, the task of the 86th Infantry Brigade, on the left, being to capture and consolidate a position running from the canal close to Marcoing to Noyelles-sur-l'Escaut. As the time for its advance depended on the capture of the first two positions by the other divisions, the signal for movement was to be the Middlesex Regiment's regimental call, followed by the "Advance," sounded on the bugle. Each battalion was to repeat the order, using its own call. The four battalions of the Brigade were to advance in diamond formation, the 16th Middlesex Regiment being at the point and the 1st Lancashire Fusiliers (Major T. Slingsby, M.C., in temporary command) at the rear, with seven hundred yards seperating the nearest platoons of the two units. The object of this method of advance was to ensure that, if the leading battalion was held up, the flank units could still move straight forward and turn the enemy's position, a system which proved most effective on this occasion. Within each battalion, the companies were similarly disposed and for the same reasons. The 1st Battalion was responsible for the complete mopping-up of Marcoing to the west of the River Escaut, after which the whole battalion was to dig in west of that place and be in brigade reserve, ready to counter-attack if required. "B" (Captain C.L.Rougier) and "D" (Captain T. Newton M.C.) Companies were detailed for the mopping-up task. At 11.30 p.m. on 19th November the battalion marched off through Fins to the brigade assembly point, which it reached at 5.30 a.m., after a long halt at about 1 a.m. and other delays caused by the moving up of tanks. Companies then shook out into artillery formation and waited for zero. The morning was very misty and it was impossible to see more than a hundred yards; but arrabgements had been made to march on a compass bearing of 41 degrees magnetic. At 6.10 a.m., the tanks emerged from their hiding places and moved forward. Ten minutes later, a short bombardment of a great number of guns, whose presence had been skilfully concealed, opened on the enemy's lines; and the battalion began to advance across country. The operation was carried out with entire precision and steadiness without any interference by the enemy's artillery; and at 7.30 a.m. the battalion had its first halt, on the sunken road between Villers-Plouich and Beaucamp, where equipment was taken off and hot bacon and tea were served out. The first phase of the battle had been a complete success. The Germans had been totally surprised and the Hindenburg Line on the frontage of attack had been captured very quickly without much opposition. In consequence, large numbers of prisoners began to come past the battalion, which was naturally encouraged by the sight. Orders for a further advance, to the Plouich line of the old British front trenches, were received at 10 a.m. And at 10.30 a.m. the long awaited "Advance" was heard on the bugle. 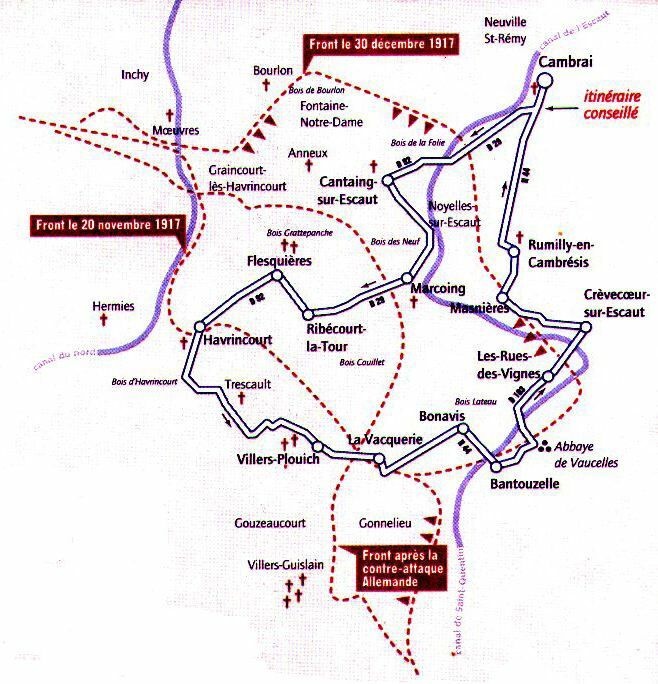 The battalion moved forward with companies and platoons in diamond formation in a north-north-easterly direction along the western side of the Couillet valley leading from Villers-Plouich to Marcoing and thence towards the Bois des Neuf. This advance also was carried out with great steadiness; and, as the ground had been only slightly cut up by shell fire and as the tanks had made many gaps in the thick wire of the Hindenburg Line - so thick and strong that millions of pounds' worth of shells and several weeks of bombardment would have been needed to demolish it - the going was good and direction easily maintained. At 11 a.m. the battalion crossed the Hindenburg Line and at 11.30 a.m. the Hindenburg Support Line. As it passed Ribécourt, tanks could be seen engaged on the fringe of a wood to the north of the village and the German machine-gun and rifle fire which was coming from that quarter was soon extinguished. When "A" Company, in the van of the battalion, reached the western outskirts of Marcoing, barely a shot was to be heard. "B" and "D" Companies at once set about their task of searching and clearing the village, while "C" Company were sent to help the King's Own Scottish Borderers in a similar duty. "B" and "D" met but little opposition, though they had to dispose of a number of Germans whom they found in the streets and in the houses. Some idea can be gained of the extent of the surprise of which the enemy were victims from the fact that Captain T. Newton, M.C., discovered two Germans sitting at a table drinking. As their reply to his call to surrender was a dive for their rifles which were leaning against the wall, he summarily ended their activities with his revolver. Meanwhile, Private D. Doherty, one of the battalion scouts, had seen a German machine gun open fire on the right of the village. He worked his way towards it and rushed it single-handed, killing four of the crew and seizing the gun. His courageous act unquestionably saved the battalion many casualties. As soon as the village was clear of Germans, the two companies rejoined the rest of the battalion, which up to now had suffered its only two casualties of the day, which were two men wounded by German snipers lying hidden in long grass west of Marcoing and only firing when the leading waves had passed them. The time was then 1 p.m. The battalion was disposed with its headquarters, "A" and "C" Companies on a sunken road leading west from Marcoing towards Flesquières, with "B" and "D" in support south of the road. This arrangement had to be altered a little later in order to protect the left flank of the brigade; and "D" Company dug two strong points about one hundred and fifty yards west of the road leading to Bois des Neuf and a third in support of them, all facing north-west, while "B" was placed in a quarry in support of the 1st Royal Guernsey Light Infantry. By 2.30 p.m. the task of consolidation was well in hand, and the rest of the day passed uneventfully, though the battalion was able to help the 2nd Royal Fusiliers by sending up to them a German machine gun and twelve boxes of ammunition which they had captured. The 21st opened quietly, though the nosecap of a British 60-pounder shell by some strange mischance ricocheted into the quarry occupied by "B" Company, hit a bag full of rifle grenades and exploded one, with the result that five men were wounded. At 11 a.m. orders were received that one company was to be sent to work with a company of the 2nd Royal Fusiliers in support of the cavalry who were co-operating in a tank attack on Cantaing , about a mile and three-quarters north of Marcoing. "A" Company moved off at 12 noon under Lieutenant H.W.Milligan for this task. One platoon under Second-Lieutenant A.S.Davison was at once sent to help the cavalry to get possession of some lock gates north of Noyelles; and the remaining two platoons of the company moved toward Noyelles, which was to act as the deploying point for the cavalry before they attempted to cut off the enemy east of Cantaing as these were driven out by the tanks, while the infantry moved up in support and formed a defensive screen, pushing forward strong patrols as the cavalry advanced. This plan was based on the assumption that Noyelles was clear of enemy, as had been reported. But when "A" Company arrived there, accompanied by the battalion intelligence officer, Lieutenant J.E.Cotgrave, who had come to establish a forward liaison post at the southern end of Noyelles, it found that the Germans were holding the village in force. Milligan decided to try to make his way through and led his two platoons forward. But the German resistance was too strong for him and he could make very little progress. Cotgrave sent back a message asking for the help of the tanks and two of them arrived at 2.30 p.m. Followed by Milligan's men, they succeeded in dislodging the enemy; and by 4 p.m. the village has been cleared right up to the River Escaut, though unfortunately Milligan and Second_Lieutenant W.Griffiths were killed and about twenty-five other ranks were killed and wounded in the process. On the other hand, this minor action succeeded in liberating 150 civilians, whose joy at being taken away towards their own people in freedom after three years of German occupation was pathetic to see. That night the battalion was relieved by the 1st King's Shropshire Light Infantry and the 8th Bedfordshire Regiment and moved to cellars and the vault of the church in Marcoing, which was still receiving very little shelling from the enemy - a different state of affairs to that of ten days later. During these two days, the battalion's casualties had been 2 officers and 5 other ranks killed, 2 officers and 37 other ranks wounded and one man missing. Private D. Doherty, to whom these comparatively light casualties were largely due, was awarded the Distinguished Conduct Medal.